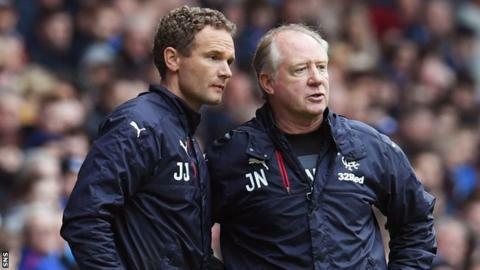 Former Rangers assistant Jonatan Johansson has been lauded for his "great football brain" as he was named Greenock Morton manager. The 43-year-old, who has signed a two-year contract, went into coaching as Morton's reserve boss in 2012. He went on to coach at Motherwell and was assistant with his national squad and, most recently, Rangers. "JJ has a fantastic work ethic, a great football brain," Morton chairman Crawford Rae told his club website. Rae is considering legal action after Ray McKinnon left Morton to become Falkirk manager on Friday only four months after taking over at Cappielow. But Morton have acted quickly to appoint the former Rangers, Charlton Athletic and Finland striker as his successor. "Jonatan has a fantastic CV, both playing and coaching, and has been eager for an opportunity to get into management," Rae said. "We are thrilled about our appointment and we look forward to sharing this new chapter together. "I cannot wait to see him in action as we rekindle Greenock Morton's long-standing Nordic association of over 50 years." Johansson had been an assistant under Pedro Caixinha, Graeme Murty and Jimmy Nicholl last season but left after the appointment of Steven Gerrard as manager. Morton lost their first game without McKinnon, 1-0 away to Partick Thistle on Saturday, to drop to fifth place in the Scottish Championship.